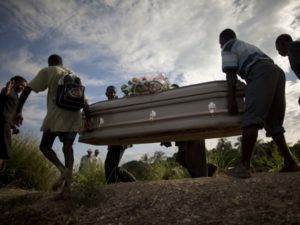 UNITED NATIONS — The United Nations has “a moral responsibility” in the deadly cholera outbreak that has killed more than 8,500 Haitians and sickened another 600,000-plus, the head of Haiti’s government said Thursday in his debut before the global body. With President Michel Martelly among a list of world leaders shirking off an appearance at this year’s U.N. General Assembly, Prime Minister Laurent Lamothe used his appearance in the global spotlight to call on the U.N. to do more to help Haiti eradicate what experts are calling the world’s worst cholera outbreak. Lamothe’s criticism is the most public pronouncement by a Haitian official yet. After refusing to blame the U.N., the Martelly administration is increasingly joining the ranks of human rights activists, cholera victims and their families, and even some U.N.-hired experts that accuse the organization of responsibility for the outbreak. Despite mounting evidence linking Haiti’s cholera to Nepalese soldiers deployed to the country soon after its Jan. 12, 2010 earthquake, the U.N. has refused to take responsibility. U.N. spokesman Martin Nesirky said that “Everybody is entitled to demonstrate, to express their opinion.” He added that Secretary General Ban Ki-moon is committed to helping the people of Haiti overcome the cholera epidemic. Last year, Ban launched a $2.2 billion, 10-year cholera eradication plan to help Haiti and the neighboring Dominican Republic fight cholera. Still, he did credit the U.N. with contributing to Haiti in other ways. “Our country is now stable and secure thanks to the support of MINUSTAH to the national police,” Lamothe said about the U.N. peacekeeping mission that will soon mark a decade in Haiti. With Haiti committed to judicial and police reforms, Lamothe said, the country “commends the progressive withdrawal of MINUSTAH,” which is now only possible thanks to advances on security. Despite daily challenges, Haiti continues to make progress, said Lamothe. In his speech, he highlighted a number of social programs — many of them controversial — that, he said, are aimed at fulfilling the 2015 development goals outlined by the international community. The successes, Lamothe said, include 1.2 million Haitian children with free schooling, and more than 1 million Haitians benefitting from social programs, such as food baskets. Donors and government critics have said the programs lack transparency and criticize them as vote-getting schemes. “If the international community had fully respected its commitments to the tune of $10 billion, the results would be even better today and the suffering of the Haitian people would be less harsh,” he said. Lamothe was the final Caribbean speaker in a day that kicked off with Guyanese President Donald Ramotar. Ramotar highlighted a number of concerns being raised by most of the 15-members of the Caribbean Community, which includes Haiti. Among the concerns: slavery reparations, an end to the U.S. trade embargo on Cuba and the ongoing development challenges impacting vulnerable Caribbean nations. To this end, Caribbean Community Chairwoman and Trinidad Prime Minister Kamla Persad-Bissessar asked global leaders Wednesday to support Caricom nations in getting an immediate review of financing criteria. After years of poverty, many Caribbean countries are now regarded as middle-income nations, despite being highly indebted.